MVS code 167.076.0(0) | T.SPARK 1.8 CARABINIERI, based on the T.SPARK 1.8 MEDIA (16V). In addition the Carabinieri used some standard T.SPARK 1.8 MEDIA'92 for their senior representatives (autovetture di Servizio e di Rappresentanza). In the early nineties the strategic plan to the Comando Generale of the Carabinieri was to have Nucleo Radiomobile (wireless) ready cars and to replace the entire existing fleet, carrying out a revolution, similar to the purchase of the Alfa Romeo Giulia in the late fifties. 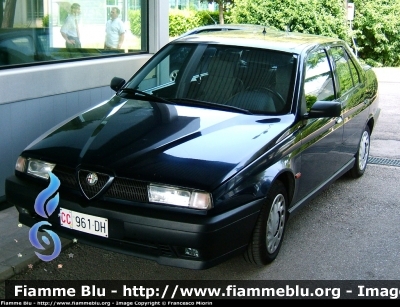 The 155 had to replace the Alfa 90 and the Alfa 75 that had become obsolete. It was the natural technical-operational continuation of a range of fast cars with heavy operational commitments. A truly modern car with high engine speed (as always), strong (as always) and economic (for the first time). In just five years (1992-1996) the Comando Generale ordered 3,483 vehicles, the highest figure ever for wireless cars. 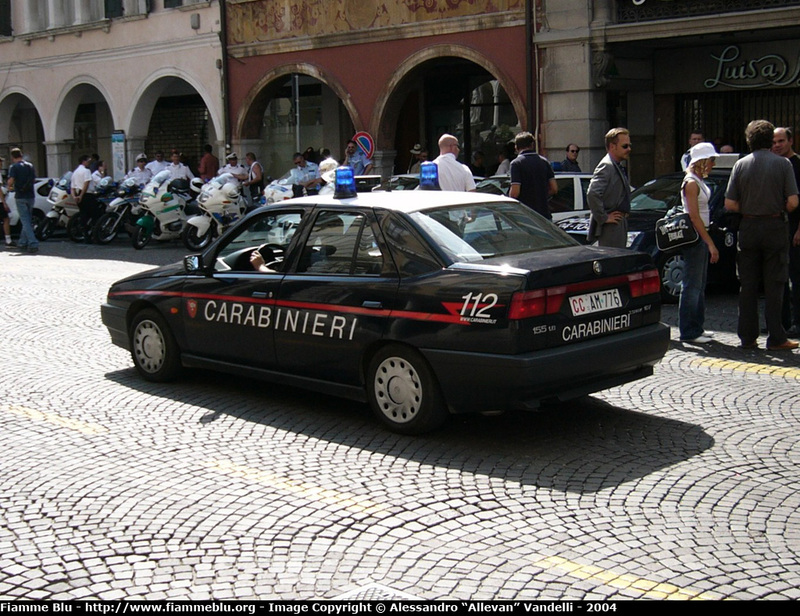 The 155 Carabinieri is still in use. No. 918 Bi-colore Carabinieri: T.SPARK 1.8 MEDIA'92. The radio number was fixed on the roof but from 1995 and onwards also at the back of the trunk. MVS code 167.076.0(0) | T.SPARK 1.8 CARABINIERI (16V): 1: 2 Letters (CC or EI); 2: 2 letters; 3: 3 digits. Photo courtesy of Edoardo Govoni at fiammeblu.org. Photo courtesy of Matteo Nava at fiammeblu.org. Note: equipped with sistema Falco. Photo courtesy of Alessandro Vandelli at fiammeblu.org. Photos courtesy of Francesco Miorin at fiammeblu.org. 1. Le autovetture dei Carabinieri: STORIA, IMMAGINI, LEGGENDE E TRADIZIONI DEI REPARTI MOBILI PIU' FAMOSI D'ITALIA, ALFA ROMEO 155 1,8 16v - twin spark; 2006. 2. fiammeblu.org: Forze dell'Ordine, Arma dei Carabinieri; 2009. 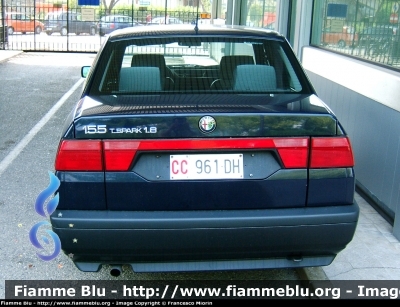 230-438 Bi-colore Carabinieri - website "Alfa 155 Club"
918 Bi-colore Carabinieri (210 + 438) - website "Alfa 155 Club"